I was diagnosed with AIDS in 1990. It seemed to me that I had no skills to understand the information concerning my own illness and death. As I watched my body beginning to wither I had to comprehend the new terms of my life, to put them in some meaningful form. I could only do that through my Jewishness. When I heard of AIDS referred to as a plague, I thought how ironic that I, a Jew, a descendent of those Hebrew slaves spared from all the plagues, would succumb to one. I wanted a gesture that would cause the Angel of Death to pass by me, and thought about smearing blood on my doorposts. 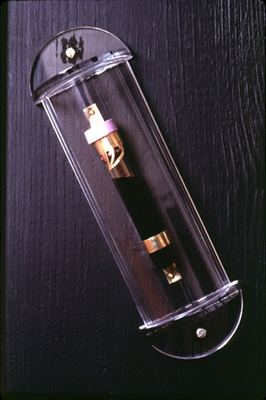 The idea of an AIDS Mezuzah emerged from the imagery of the Exodus story. I needed something that would transform my experience, while staying in the context of my tradition. I wanted something that would continue to make my life and my Jewishness meaningful, and bring a sense of order to the chaos I found myself living. 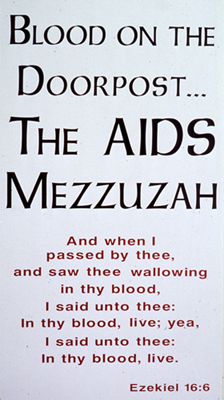 I have also been aware of the slow and ineffectual response of the Jewish community to the AIDS crises. 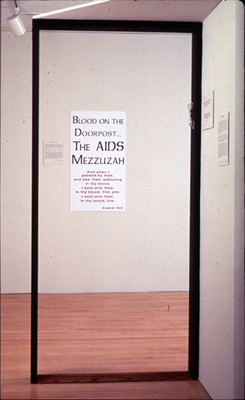 Hundreds, maybe thousands, of Jews have suffered and died of AIDS, yet in an organized communal response the Jewish world seemed silent. 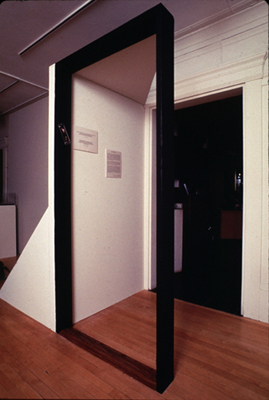 The effect on me was a sense of invisibility, of alienation and separation. I wondered how I could make the Jewish world take notice of the suffering that was going on in its midst, and thought of using traditional Jewish rituals, symbols and objects to deliver the message. 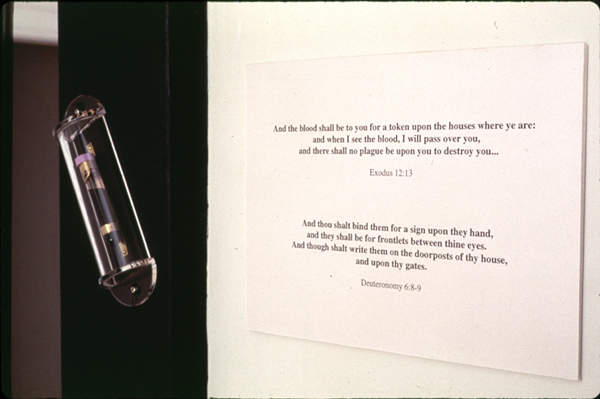 Watching the blood flow out of my arm into one of the vials during my weekly blood test, I decided to use my own blood to put on the doorposts of my house or any building and draw attention to the suffering within the Jewish community.